Weighing in at 43,226 tons of steel and concrete the magnificent Gateway Arch is still the tallest man-made national monument in the United States. The renovation project began in 2014 and is still under way with the BlueDuct portion complete as of April 2017. The architect was very specific on which areas the contractor-System Aire could run duct work and air control which proved to be a challenge everyone was up for. 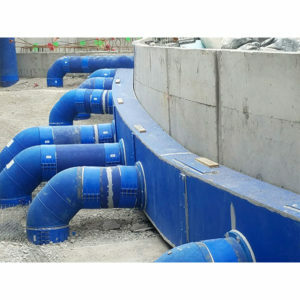 The BlueDuct® underground duct provided an underground solution that the project required. Installation of the The BlueDuct® preinsulated Duct System at the Jefferson Memorial Gateway Arch. In 1963 construction began on the Gateway Arch which was a representation of Thomas Jefferson and St. Louis’ role in the western expansion. Weighing in at 43,226 tons of steel and concrete the magnificent Gateway Arch is still the tallest man-made national monument in the United States. The renovation project began in 2014 and is still under way with the BlueDuct® portion complete as of April 2017. The architect was very specific on which areas the contractor-System Aire could run duct work and air control which proved to be a challenge everyone was up for. AQC was uniquely positioned with their underground duct solution – BlueDuct®. “The underground duct provided a solution that no other ducts were able to accommodate. We needed to go underground since the project had special requirements” stated Jim Fahrenhorst from Thermal Mechanics. Continus curved radius grill plenum was custom built to fit around the 100ft curved concrete wall shown here. A prototype undergroud vault was crafted and sent to St. Louis, MO. By creating a vault system with a 30” x 30” floor access to house VAV boxes Thermal Mechanics was able to put connection points into the vault to run power, communication and hot water piping for the VAV reheat coils. Tom Fry, from AQC, built a BlueDuct® continuous curved radius grill plenum custom built to fit around a 100 ft curved concrete wall in the new entrance portionof the project. Fahrenhorst also added “BlueDuct is easy to install, very few problems or questions from installing contractor… No surprises. Most items were in stock so they shipped out fast.” This project demonstrates the full flexibility and reliability of the BlueDuct® product.